A small company with 7 hosts in two clusters; 1 cluster of 4 hosts is EVC enabled, the other cluster of 3 hosts is not EVC enabled. 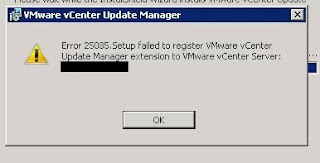 The database on the existing vSphere 4 32-bit Virtual Center has grown to over 20GB (in vCenter, estimated space required for 7 hosts and 140 VMs on default settings is just 1.32GB,) so the decision is taken to start afresh with a new database. The decision is also taken to keep the same name and IP address. 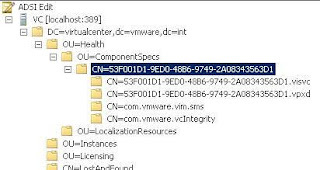 Complicating matters – the company uses Veeam Backup and Replication (on v4.1.1,) and has a small 20 seat XenDesktop 4 VDI environment, both of which talk to the Virtual Center server. All the virtual desktops had to be removed from their groups and be re-added, with users reassigned to their desktops. Virtual Machines had to be re-added to their jobs, and the old entry removed. Replicas needed to be kicked off from scratch. 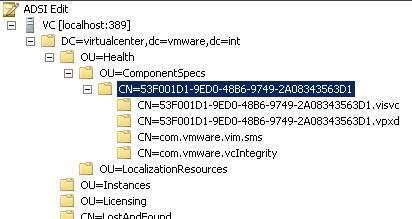 was to use ADSI edit to add CN=com.vmware.vcIntegrity which was missing, and then the install ran fine.